If you are interested in a quick desert, then this is it. 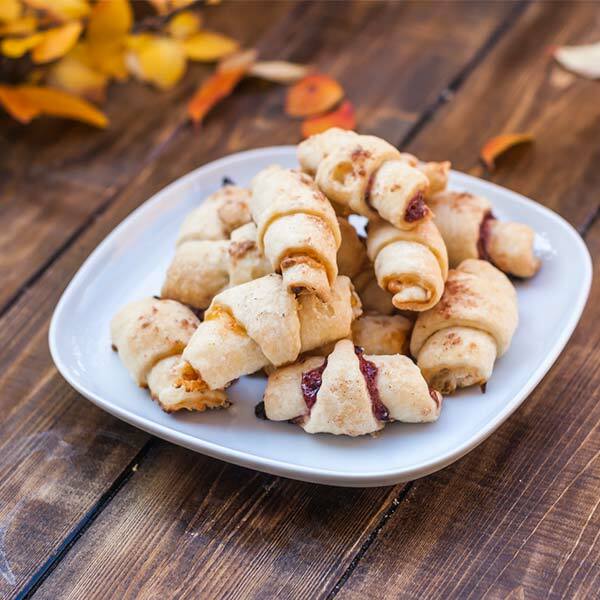 Rugelach is pastry of Jewish origin, made in the form of a crescent by rolling a triangle of dough around a filling. Can include raisins, walnuts, cinnamon, chocolate, marzipan, poppy seed, or fruit preserves which are rolled up inside… I am thinking Nutella right now! Sigh! Anyway, this is a very good desert that you can actually make it into a breakfast as well. Enjoy! In a bowl, place the flour and cold butter. With two knives start cutting into the butter until the mixture resembles small peas. 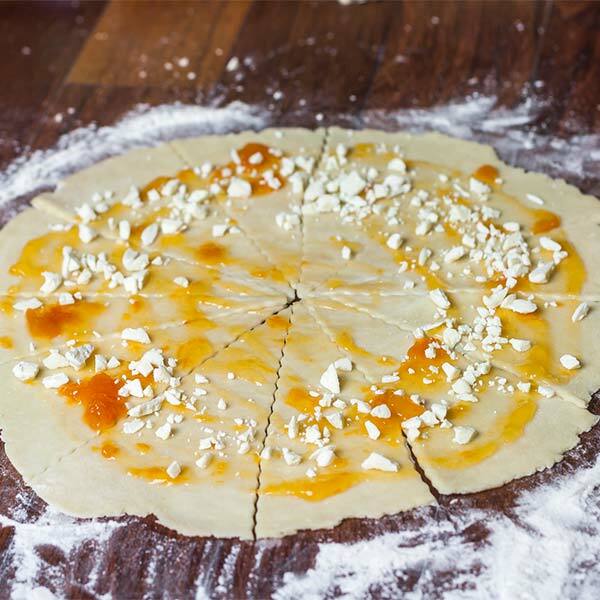 Add sour cream and vanilla extract and mix everything until the dough sticks together. Place it on a lightly floured surface and start kneading for a couple of minutes. 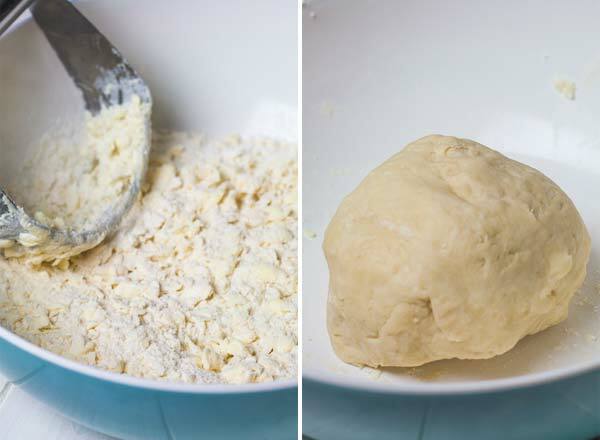 Divide the dough in three pieces and wrap it in plastic. Though you don’t have to refrigerate it, I usually like to do it for about 20 to 30 minutes as it becomes easier to work with. Meanwhile get the pecans ready, about ¾ of a cup, and put them through the food processor. When you are ready for the dough, roll out one piece into a circle of about 12 inches (30 cm) in diameter. Now you can have some fun with the jam. I used apricot and some blueberry in this case, but you can run with your imagination on this one, anything works. I also sprinkled some white chocolate here, and I forgot to take photos on pecans so make sure you add them at this step as well. For the next step I used a pizza cutter. Cut the dough in 12 pieces or less if you like them bigger. Roll each cookie starting from outside. 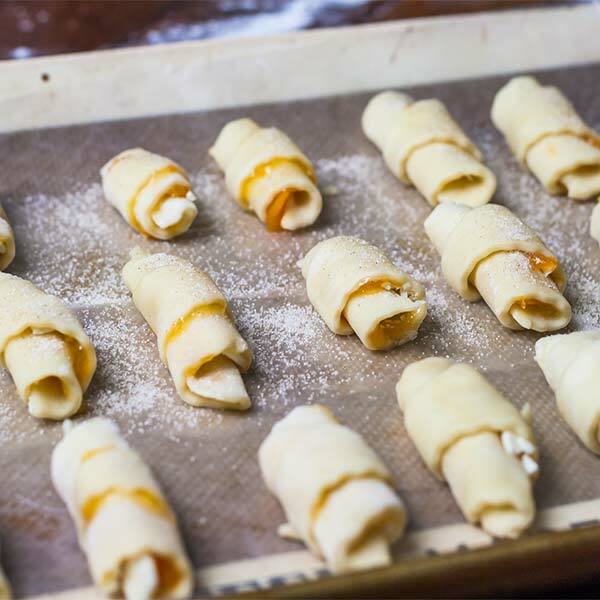 Place them on your cookie sheet and sprinkle with the sugar and cinnamon mixture (optional). Bake for about 25 minutes and enjoy! Pour flour in a mixing bowl and with a pastry cutter cut in the butter or margarine till the mixture resembles small peas. Stir in the sour cream and vanilla till the dough holds together. Place it on a lightly floured surface and start kneading for a couple of minutes. Divide the dough into 3 pieces and wrap in plastic wrap. Roll one piece of the dough at a time into 12 inch (30 cm) circle. This is like making pizza. 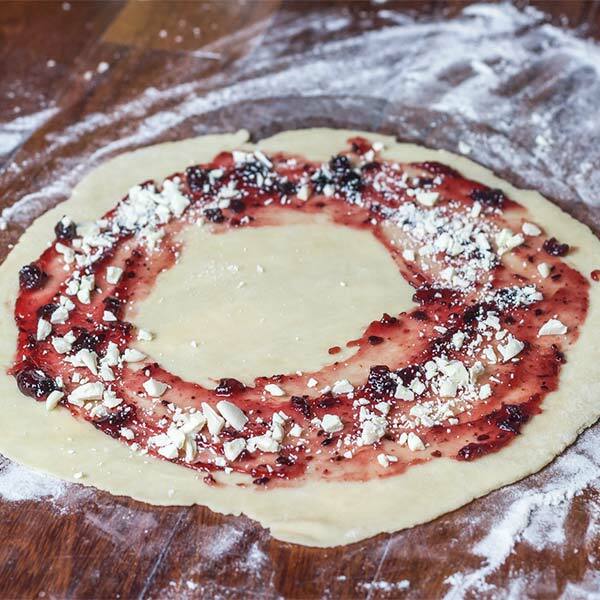 Spread the dough with 2 tbsp of jam and sprinkle with one third of the chopped white chocolate in a circle but leave the middle empty. Using a pizza cutter cut the dough into 12 wedges. Starting at curved edge, roll up each wedge and place point-side down, on an ungreased baking sheet. Repeat with the remaining dough. In a small bowl stir together the sugar and cinnamon if desired and sprinkle over each cookie. If you are trying to cut back on sugar, you can skip this step. Bake at 375° F / 190° C for 20 to 25 min or until light golden brown. I have made this with Nutella filling and it is divine.